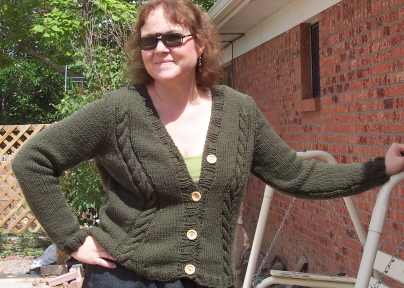 I used 15 1/2 skeins of Kool Wool in "Khaky" for the 42" size. Much less than called for in the pattern. Size 10 1/2 Denises. This only took about a week to knit. (Altogether!) No mods besides fixing a mistake in the pattern for the first front. I love it!